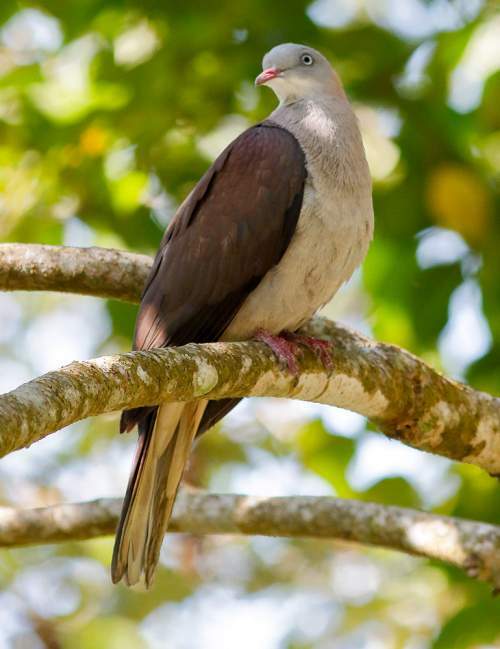 The mountain imperial-pigeon (Ducula badia) belongs to the family of doves and pigeons, the Columbidae. The mountain imperial-pigeon species is distributed in India, Nepal, Bhutan, southeast Asia and China. Hitherto these imperial-pigeon species were considered conspecific with Ducula cuprea. These imperial-pigeons are polytypic species. The mountain imperial-pigeon (Ducula badia) is a large imperial pigeon, measuring 40 to 50 cm in length and weighing 320 to 660 grams. The mountain imperial-pigeon has vinous-gray head, neck and underparts. The hindneck is pinkish. The throat is whitish. The wings and the upperparts are dull brownish-maroon. The tail is long. The uppertail is gray and the undertail is whitish. The bill is long, pointed and pinkish. The tip of the bill is whitish. The irises are whitish. There is a gray eye-ring. The legs and feet are pink. The call of the mountain imperial-pigeon is a resonant hooting "hu....hoo" sound. These mountain imperial-pigeon species are distributed in India, Nepal, Bhutan, Myanmar, Thailand, Cambodia, Laos, Vietnam, Malaysia, Brunei, Indonesia and China. In India, these imperial-pigeon species are distributed in the states of Sikkim, northern West Bengal, Assam, Meghalaya, Arunachal Pradesh, Nagaland, Tripura, Manipur and Mizoram. 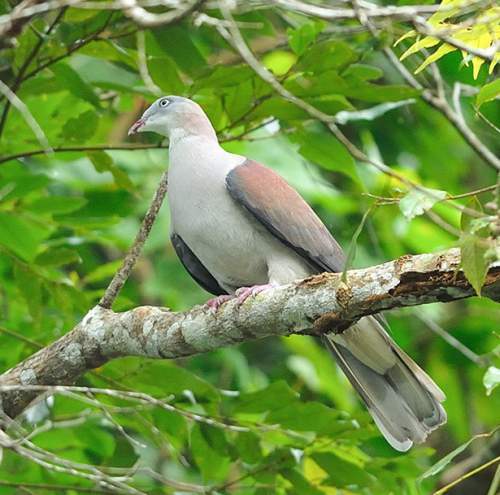 The nominate mountain imperial-pigeon subspecies D. b. badia is distributed in Malay Peninsula, Sumatra (Indonesia), Borneo (Indonesia and Malaysia) and west Java (Indonesia). The imperial-pigeon subspecies D. b. griseicapilla is distributed in northeast India (Nagaland, Manipur, Arunachal Pradesh, Tripura, Mizoram), Myanmar, Thailand, Cambodia, Laos, Vietnam and south central China. The imperial-pigeon subspecies D. b. insignis is distributed in central Nepal, Bhutan and India (Sikkim, northern West Bengal, Assam, Meghalaya). 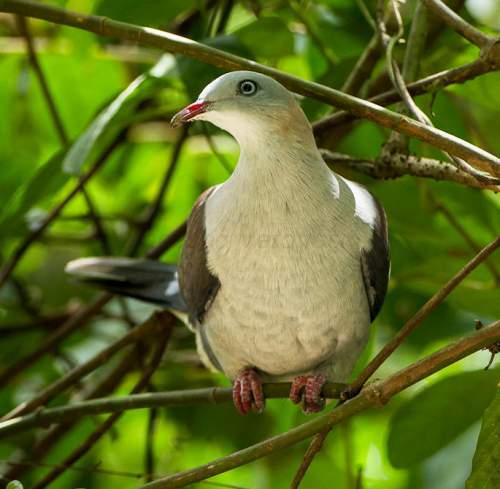 These mountain imperial-pigeon species have high forest dependence. They normally occur in altitudes from 0 to 2300 meters. 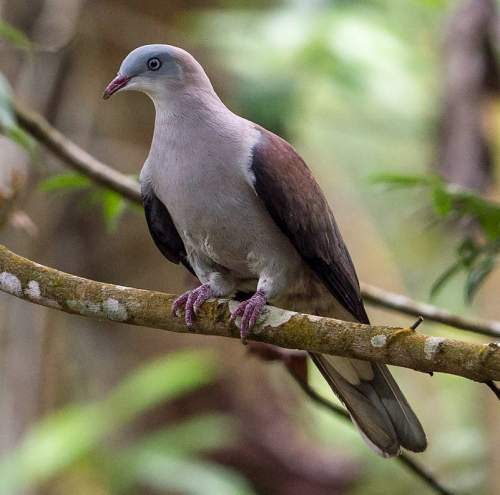 The natural ecosystems and habitats of these imperial-pigeon species include tropical and subtropical moist montane forests, evergreen and deciduous forests, tropical and subtropical moist lowland forests, old-growth forests and mangrove forests. The diet of these mountain imperial-pigeon species consists mainly of fruits. Wild fruits, berries, figs and nutmeg are their primary food. The fruits are plucked and swallowed whole. Occasionally they go to the ground to drink. The breeding season of these mountain imperial-pigeon species is extended depending upon food availability and weather. The subspecies D. b. insignis (Nepal, Bhutan and India) breeds from March to August. These imperial-pigeon species are monogamous. The nesting sites include fork and branches of trees. The nest is a flimsy platform built with sticks and twigs. The clutch contains one or two eggs. Both the parents incubate the eggs. The nestlings are fed with crop milk, a thick cheesy substance, derived from sloughed off squamous cells from the crop of both male and female birds. These mountain imperial-pigeon species are non-migratory resident birds. The populations in higher altitudes descent to lower levels in winter. The global population size of the mountain imperial-pigeon (Ducula badia) has not been quantified. The overall population trend of the species is considered to be decreasing. In most of its range, this species is reported to be fairly common. The generation length is 6.6 years. Its distribution size is about 8,450,000 sq.km. Habitat alteration, fragmentation and destruction, deforestation, human intrusions and disturbance, commercial hunting and capture for pet-trade are the main threats that are endangering the survival of these species. The mountain imperial-pigeon (Ducula badia) does not approach the thresholds for being Vulnerable, either under the range size criterion, or under the population trend criterion or under the population size criterion. The CITES (Convention on International Trade in Endangered Species of Wild Fauna and Flora) status is ‘Not Evaluated’ for the mountain imperial-pigeon (Ducula badia). 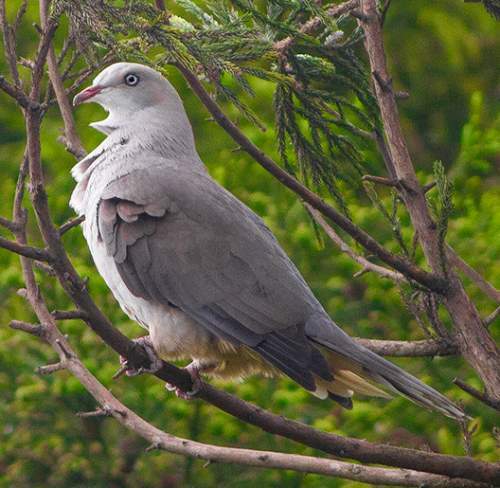 The mountain imperial-pigeon (Ducula badia) was earlier considered conspecific with Nilgiri imperial-pigeon (Ducula cuprea). D. b. griseicapilla Walden, 1875. Current topic in Birds of India: Mountain imperial pigeon - Ducula badia with photos.